Liam Guthrie runs in to bowl. A MAIDEN First Grade century to left-hander Sean Roberts led Perth to a thrilling five-run win over Wanneroo in WACA Premier Cricket at Fletcher Park. A product of the Perth juniors, Roberts made 101 off 110 balls with eleven boundaries. His 100-run partnership with Jacob Snadden (40) was the backbone for Perth’s 241 off 50 overs. Wanneroo stayed in the hunt by preserving wickets and the final over commenced with 11 runs required. 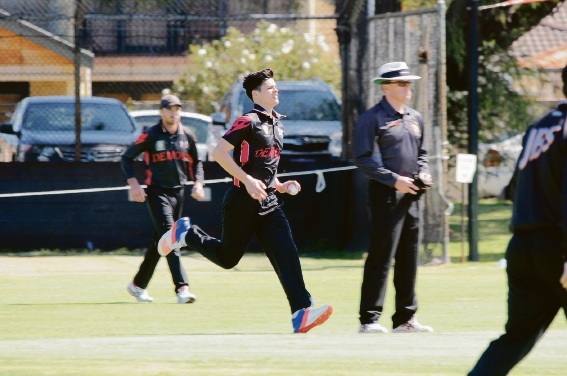 Youngster Liam Guthrie held his nerve, conceding five runs, and with a wicket and a run out Perth claimed victory. Last season’s wooden spooners South Perth started its season in terrific fashion, winning both fixtures. Darius D’Silva was important on Saturday with 69 in the 16-run win over Gosnells at Richardson Park. South Perth made 6-193 from 39 overs in the rain-reduced match, with Gosnells only managing 6-177. Nick Mitchell scored a crucial 47 on Sunday against Mt Lawley at Breckler Park as the Sky Blues edged to victory by eight runs.